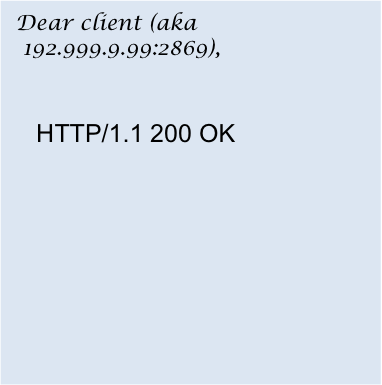 Welcome to part two of this series, in part one our HTTP request was sent, now lets see what we’ll get as a response. Your HTTP request managed to cross oceans and arrive at its destination. The server (host) looks at the message and despite residing in a different country than your device (the client) it knows how to decipher the message’s content because it’s labeled as following HTTP protocol. In a URL the http can be referred to as the scheme. The digits represent the port of the server and are optional. If a port isn’t specified the default port will be used, for HTTPS it’s 443 and for HTTP messages it’s 80. You can think of the syntax structure of headers as being similar to key value pairs in a Ruby hash or a dictionary in Python. Wow, that seems like a whole lot of nothing. All we see here is a status code - that’s all that is required in the response. A status code is the three digit number that tells us the outcome of our request such as whether the resource was found at the expected path, was found elsewhere on the server or that the request was simply unsuccessful. You can see there’s also a bit more on the one line response that we received: the HTTP version number found prior to the status code and a status text following the status code. The status text is there to give a brief description of the status code to make life easier for us lowly humans. For these codes the text is a reasonable description of the status of a request. They relate to whether a) the resource was found (200 and 302) b) the resource was found elsewhere on the server thanks to URL redirection (302) c) the resource was not found (404) or d) an internal server error occurred (500). Of course most responses will include more than just one line of text. There is usually a message body that contains the resource you’re hoping to access. A final note about the HTTP protocol, it’s stateless. This means each HTTP cycle is independent of the cycles that have occurred and will be occurring in the future. There are ways to simulate statefull web applications, such as using cookies, which allows us to stay stay logged in to a site even though the browser refreshes (HTTP cycles occur) as we navigate the site. However in and of itself HTTP remains a stateless protocol. To recap an HTTP request needs to contain a method, a path and a host name (the value of the host header). An HTTP response needs to contain a status code. A number of different types of headers can be found in both requests and responses, the resources below include other common headers that you are likely to encounter. I hope you’ve found this overview helpful as a high level understanding of HTTP cycles. The following are some excellent resources that relate to this topic including Launch School’s Open Book Shelf (free to access even if you’re not a student).